The right angulation and down angulation, for which the extensor muscle of the thumb is used, are more difficult than the left angulation and up angulation, which is done with flexor muscle of the thumb. In gastroscopy the right rotation and the up angle can be substituted for the right angulation. The reason is that the esophagus, the part closer to the endoscopist's hand than the stomach, runs straight, therefore the rotation can be substituted for angulation. However, in colonoscopy the sigmoid colon, the part closer to the endoscopist's hand, is not necessarily straight, so thoughtless rotation can end up in the loop formation, therefore, rotation is not used as substitute for angulation. Angulation should be controlled only with the thumb. It is not recommended to use a middle finger from the opposite side of the knob because enough and appropriate force and control can hardly be attained in this thumb-and-middle finger maneuver. 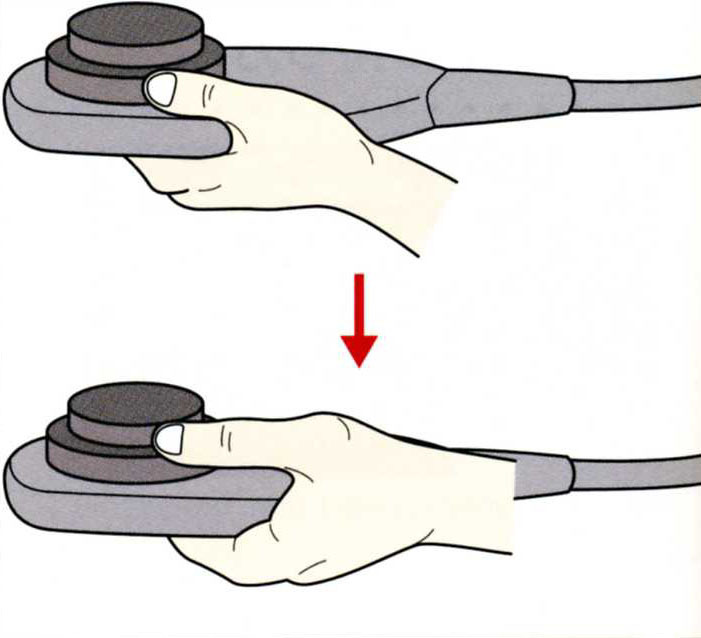 Actually both the u/d angulation knob and the l/r angulation knob cannot be moved at the same time, so it makes sense to apply a thumb only since the more accurate and more dynamic movement can be possible. To get a firm right angulation the base of the thumb has to be shifted. This is called "grip change" (CHART 9-1). Imagine the thumb moving up from the first floor to the second floor. Thereby the thumb will not touch the u/d angulation knob when it applies the l/r knob. WHEN USING THE L/R ANGULATION KNOB THE BASE OF THE THUMB SHOULD SHIFT UPWARD. Learn the "lock-to-lock" motion (dialing the control knob all the way, clockwise and counterclockwise) without a grip change in one action. The trick is not to bend the thumb (CHART 9-2). First practice the lock-to-lock motion with the u/d angulation knob, then with the l/r angulation knob. It is important to do it without a grip change in one action. Practice until you can do the movement smoothly and comfortably. PRACTICE UNTIL YOU CAN PERFORM THE LOCK-TO-LOCK MOTION SMOOTHLY WITHOUT A GRIP CHANGE. The position of the base of the thumb when operating the up / down angle is here. The position of the base of the thumb when operating left and right angles is here. Then you can manipulate left and right angles without touching up and down angles. It is like moving from the first floor to the second floor. This is called grip change. 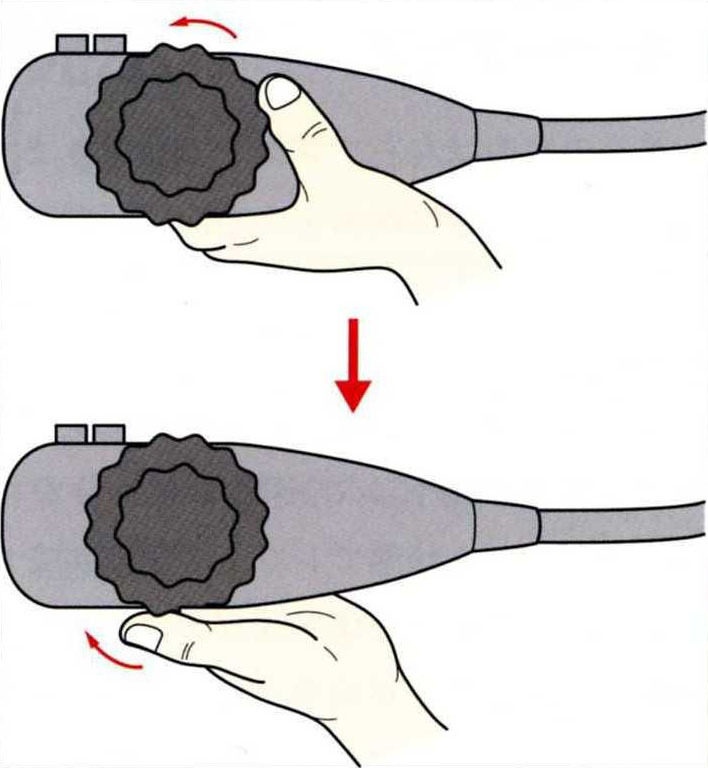 The upper and lower angle touch the tip of the knob at the tip of the thumb. This is the full up angle. I will apply down angle full down without changing over. Practice to be able to do without switching from full up to full down. Likewise the right angle also applies the left angle until the full angle. I practice to be able to do full-to-full flight from full to full. Regular bending can be passed over with the r/l angulation knob, but for the acute bending it is necessary to move the bending upward and traverse it with the up angulation. However, when the bending is too acute even the full up angulation, dialing the u/d control knob to the extreme ("the lock"), is not enough to reach. In that case, use the left angulation while keeping the up angulation at the lock position. In this state the scope will not move to the left and the up angulation will be enhanced instead. This is called "super up" and it is applied when the strongest angulation is needed (CHART 9-3). This maneuver is often used in the gastroscopy for the "U-turn" observation. USE THE LEFT ANGULATION WHILE HOLDING THE FULL UP ANGULATION. THE KEY TO THE SUPER UP ANGULATION IS TO RELEASE THE THUMB FROM THE U/D ANGULATION KNOB AND THEN APPLY THE LEFT AND UP ANGULATION SIMULTANEOUSLY. Even when full up angle is full, there are times when the angle is not enough yet. In such a case, apply the left angle at the same time as the full up angle. Turn back the full up angle slightly and apply it at the same time as the left angle again. Angle stronger than full up angle can be applied. This is a super up. I got a strong up hill angle.